Witches&Pagans #23 Law Vs. Chaos (download) [wp023e] - $6.95 : BBI Media - Magazines that feed your soul. This was supposed to have been the “Law Vs. Chaos” issue but it turned out more like the “Law & Order” issue. That said, this issue could just as easily be titled the "Hero" issue — bringing together, as it does, some of the most stalwart, valiant, and just downright gutsy men in modern Pagan/polytheist culture. 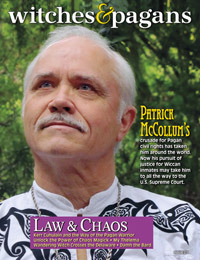 In this issue, we highlight the work of Pagan chaplain and activist Rev. Patrick McCollum, whose two decades of ministry to the least among us — incarcerated Pagans — has resulted in real progress towards guaranteeing civil rights to all religious minorities. Patrick isn't one of the Big Name Pagans that tend to dominate Pagan pop culture — he hasn't written best-selling books or founded a burgeoning tradition. Instead, he's been slogging away in the depth of the California prison system, driven only by his unyielding thirst for justice. An unsung hero, we are very proud to make Patrick the subject of our cover interview in this issue. Equally impressive, if less currently prominent, is another Pagan knight — activist, author, and Pagan law-enforcement pioneer Kerr Cuhulain. Kerr blew open the doors of the law enforcement Broom Closet way back in the 1980's when the Satanic Panic threatened to poison the culture against Pagans in general. Courage doesn't even begin to describe what Kerr did — putting his career on the line as the first openly Pagan cop — and he has continued his anti-defamation work, as well as founding an order of Pagan knighthood, in the succeeding decades. Kerr tells it like he sees it about Pagan manhood, discipline, law enforcement and much more in our in-depth interview. There's other kinds of heroes profiled in this issue as well. Chaos magicians and pioneer thinkers Peter J. Carroll, Jaq D. Hawkins, and Andrieh Vitimus share their thoughts on the practical applications of results-oriented magick, and there's a visit with the ever-charming Pagan folk musician Damh the Bard that's sure to have his fans smiling. Plus the return of Wandering Witch (with a great tour of Pagan and natural sites in Pennslyvania), Tess Whitehurst on bringing your artistic imagination to your magick, a salute to Dionysis, R.J. Stewart on the laws of magic, Galina Krasskova on the virtue of discipline, a startling column from Kenaz Filan, Ruby Sara on the magic of flowers, and a look ahead to Mabon with Deborah Blake. Plus Pagan science fiction, poetry, a double-handful of reviews and much more! Ninety-six illustrated pages.